If this is your first time purchasing at LiftRight.com, please create a new account by clicking below. New customers Click here to continue. 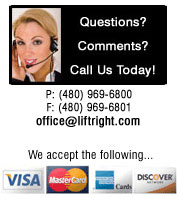 If you have purchased from LiftRight.com before, please enter your e-mail and password below. If you forgot your password, please click on Forgot Login below.